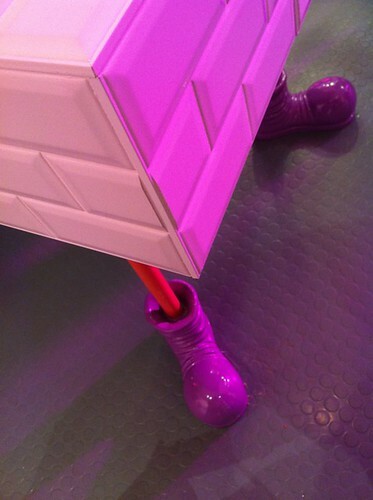 The thrill of a kid hopped up on sweets – that’s the feeling Adriano Zumbo wants to evoke in his new patisserie. 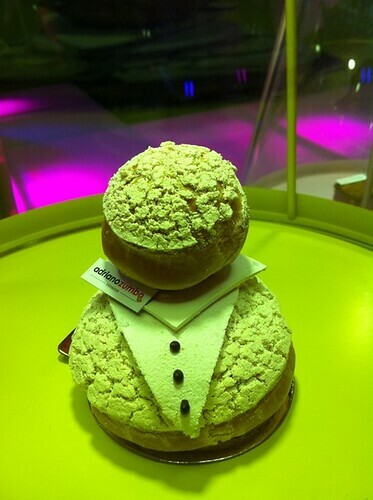 This outlet, located at The Star, lives up to his sugar-powered hopes: the interior is one long headbuzz of fun. 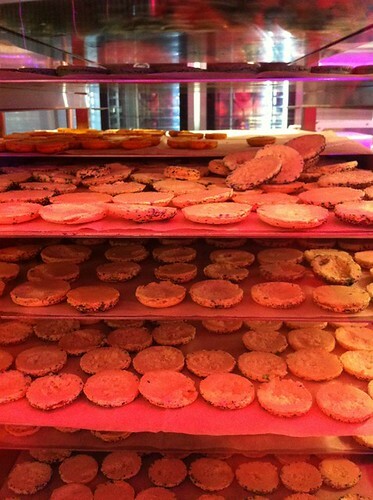 Step into this wonderland and you’d be convinced you could troubleshoot the world’s problems by simply eating macarons. 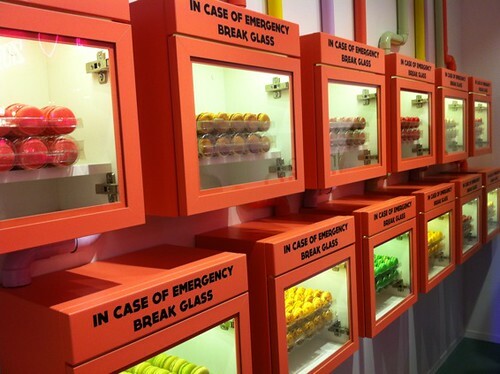 The “in case of emergency, break glass” displays only reinforce this. To get to the rows of Cola, Blood Peach and Lime & Mint Mojito flavours though, crazy Thor-style hammer action isn’t necessary – just a non-violent unlatching of the door will do. 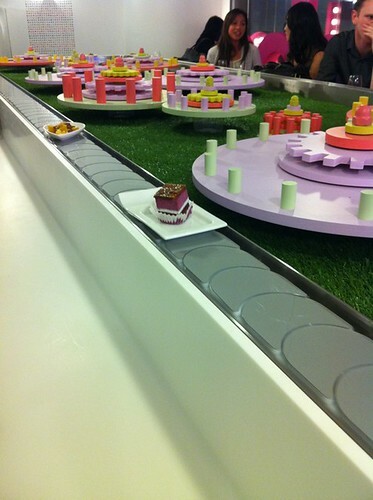 The playful interior also includes a dessert train, which zips cakes and confections through the room on a conveyor belt – the only time traffic flow would inspire your sweet tooth. 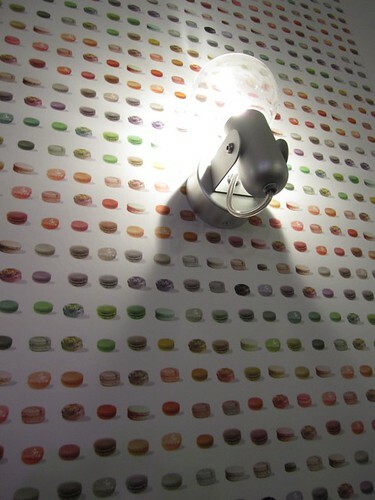 Printed across the walls, like lines of edible code, are confetti-bursts of macarons. 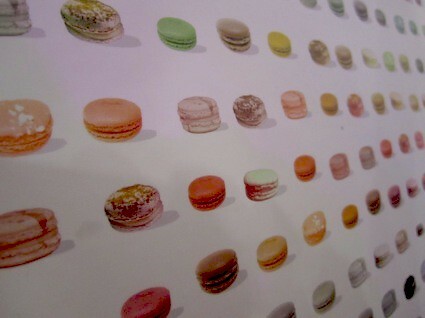 This graphic reproduction of Zumbo’s flavours is inspired by the lickable wallpaper in Charlie & The Chocolate Factory. Other Wonka-style magic includes the whimsically sloped roof and the bubbles decorating the wash area. Licorice-allstripe colours wind along the edge of the dessert train table like ribbons being unspooled. 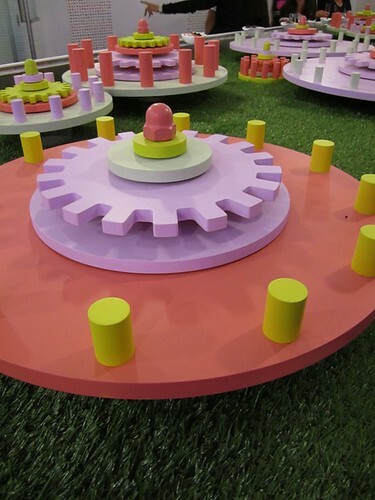 Adding to the child-like fun is a ‘Ferris Wheel’ of boots and the shoe-wearing bathtub filled with chocolate – both references to the board game Mousetrap. These imaginative flourishes were all carried out by Luchetti Krelle, the award-winning Sydney interiors firm that also created the look of the David Chang restaurant across the hallway (from the limited glimpse available, it seems to be Zumbo’s very design opposite: sleek, minimal and dark). The patisserie’s picturebook-like appearance means it’ll probably be the most-photographed eatery in Sydney – but this element alone isn’t what drives the Zumbo pilgrims. 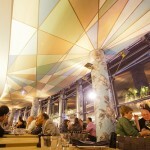 It’s the outlandish and inventive sweets that compel the crowds and the offerings available here only underscore this. There’s the Lemon Carpet Crush, a citrus tastebud-jumpstarter of lemon crush “liquid”, jelly, cake and lime marshmallow and the Water My Melons which eerily reproduces watermelon with fruit, yogurt and chocolate. Lychee gel, coconut crunch and bubble tea custard are a few of the intriguing ingredients making cameos throughout the menu. The Berry Handbag, sadly, is for display only. 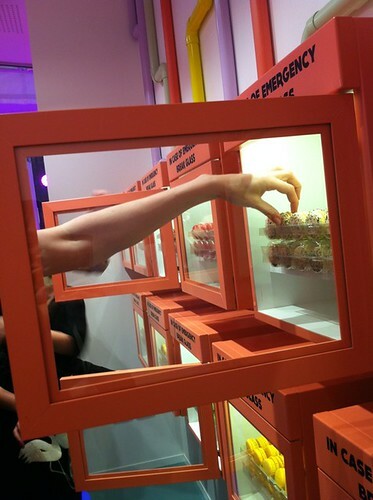 In terms of macarons, the “emergency”-saving flavours that left me buzzing most were the Thai-flavoured Coconut, Green Chilli & Lavender, Cola and Watermelon & Orange. 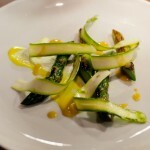 The Caramelised Pumpkin Seed might be nicer reincarnated in a bread loaf, though. 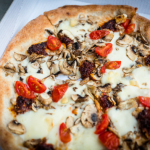 With an adventure-driven menu, the odd misfire isn’t surprising – but that kind of wildcard gamble still appeals to me more than a safer, one-size-fits-all approach to pleasing crowds. 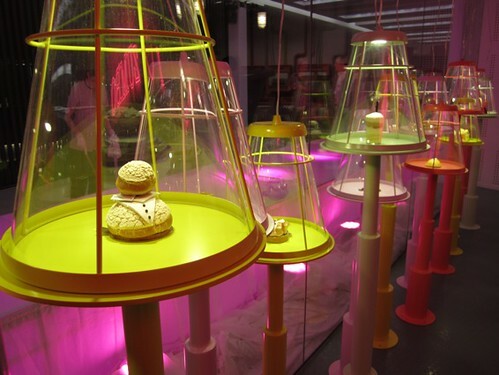 With this new location, Adriano Zumbo still casts spells through sugar. 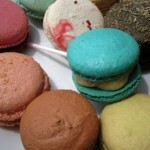 I’m pretty sure the “glass-breaking” macaron displays will end up collecting a few noseprints from overeager kids. 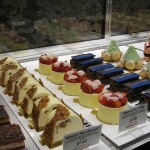 And there are worse things in life than watching a series of Zumbo desserts tailgate each other on a conveyor belt, each yours for the choosing. 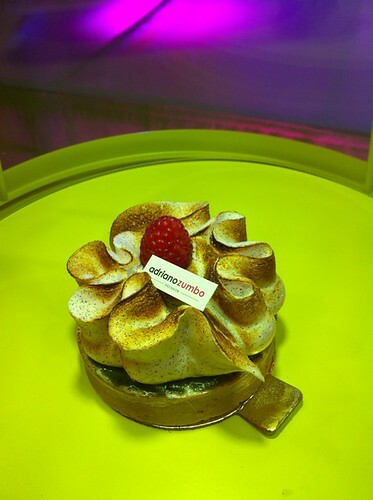 To be honest I don’t find Zumbo’s desserts to be the best in Sydney but I do admire his creativity. Great displays! I agree with lateraleating. I guess we all do eat with our eyes! 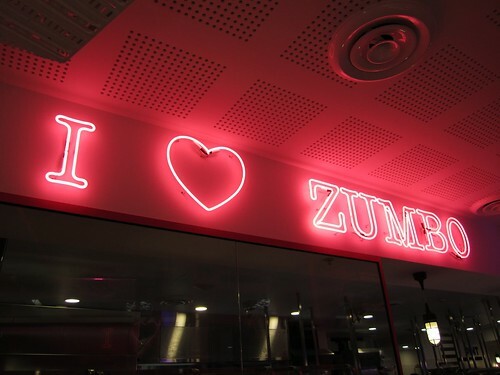 Wow what a sensational display, thats amazing, I love the Zumbo, his smile is as sweet as his cakes. 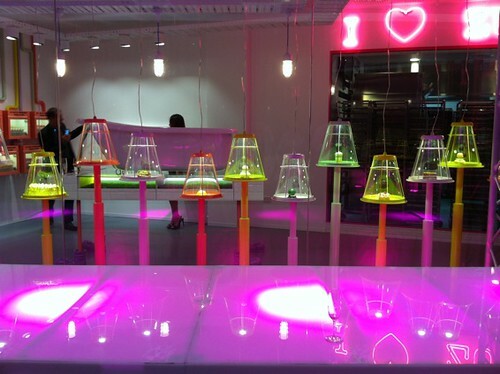 wow i def want to go check this place out! I can’t believe no one has thought of a dessert train sooner. This place is genious, if your not really a sweet tooth you still would check this place out to re-live your childhood!